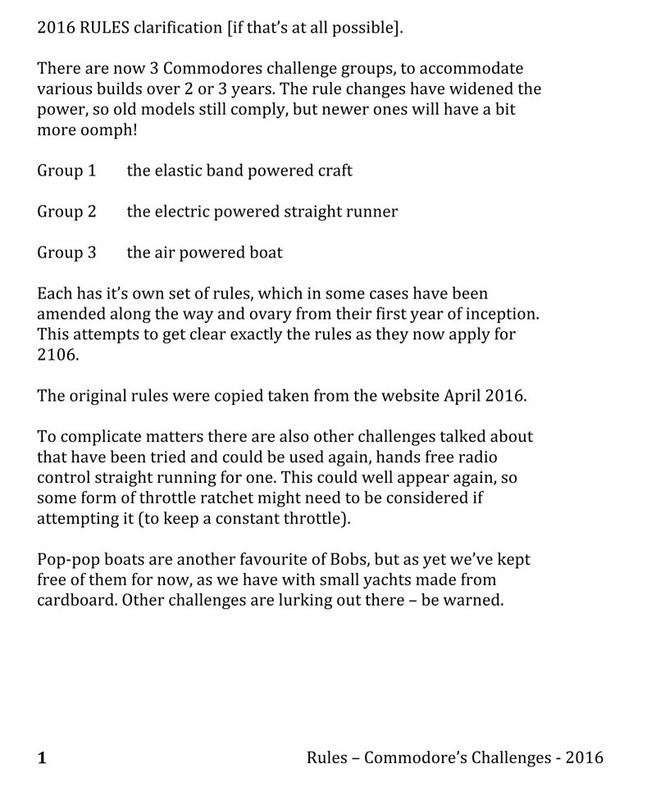 The First challenge will be called "R/C straight running" and will be a fun event so everyone can join in using existing boats. (See below for the second challenge for 2019). 1) Standard - Standard class will cover any R/C boat of any shape size or power. 2) Clever Clogs - Clever Clogs class will allow any form of auto pilot contained aboard. There will be a "distance" buoy near the far side of the lake and to the left. There will be a wide gate called the "Attempt" gate near the island then a target line of 6 buoys near the landing stage representing a bull; 2 inners and 2 outers. The sailing directions are to sail up to the left then round the distance buoy then back down through the attempt gate - all under R/C control to this point. Immediately through the attempt gate the Tx will be laid aside and the boat will sail on its own through the target line scoring the points. (No extra points for doing it underwater). 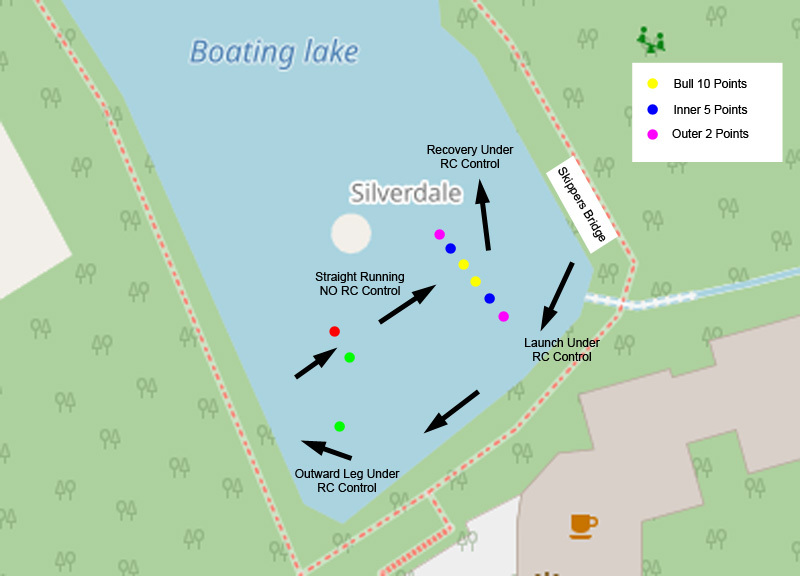 Immediately through the target line R/C control will be resumed and the boat sailed off to the right for retrieval or mooring. (R/C control can also be quickly re established if the boat runs amok). Points scored will be 10 for a bull; 5 for an inner and 2 for an outer. In the event of a tied score there will be a run-off against the clock starting with the stern touching the bank (subs on the surface). Feasibility tests have shown that an attempt should take roughly 2 mins from start alongside to finish right turn off so with a degree of readiness and no finger trouble we could get as many as say 20 runs in an hour which would allow multiple attempts and an aggregate score. Some sort of fixing throttle openings is more or less essential so that the rudder can be trimmed on the outward leg (you will need a ratchet on your RC transmitter throttle channel). It also seems advisable to keep the speed down otherwise you will be running through the remains of your own wash. Awards for 1st, 2nd and 3rd in each class plus some specials according to the Commodore's whim. The Second Challenge for 2019 will be Tethered “Juice Carton Racing” and will be held on the small table top pool at Silverdale. 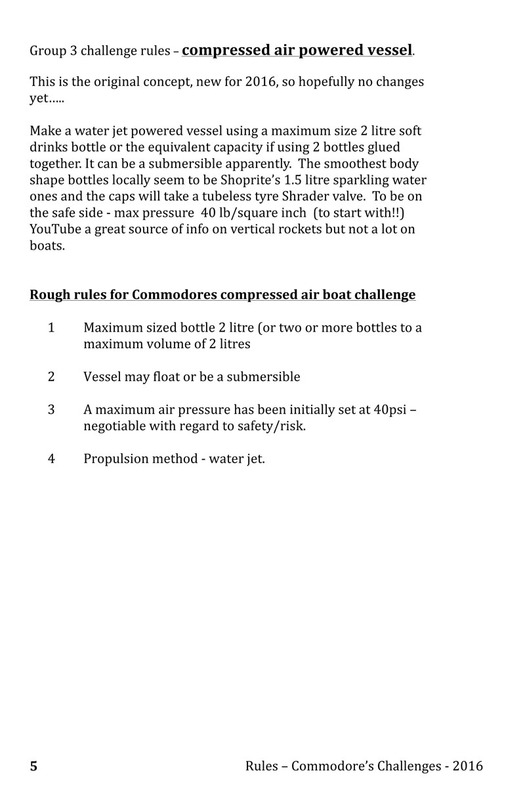 This will be a similar challenge to the hydroplanes which we ran last year, but based on a “Carton Hull” (see below). 2) Hooligan - unlimited voltage. The hull must be made from a 1 litre carton (milk or juice). You may want to check the spout position as some are better than others. Max hull length = 196 mm; beam = 70mm; Due to lack of space, prop; shaft and/or rudder can extend beyond the transom by 30mm. 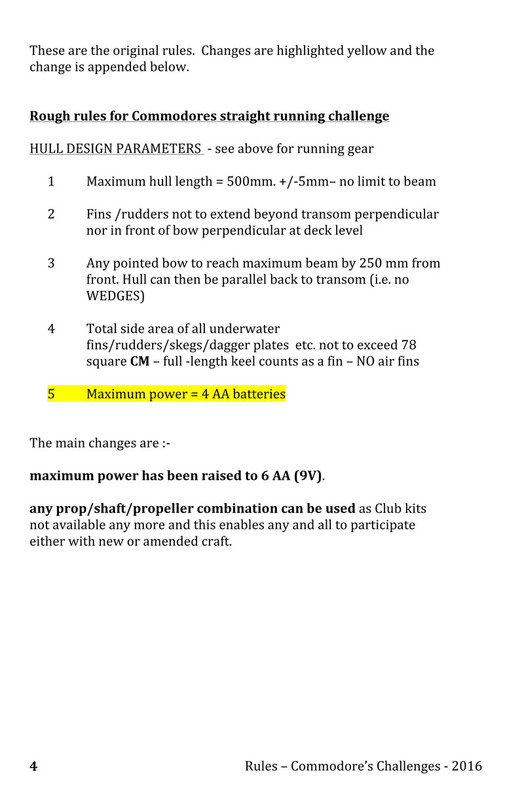 You can use any small motor, prop shaft and propeller combination but batteries must be limited to a maximum 3 dry cells (4.5 volts) for the standard class. Hooligan class can have unlimited batteries (but watch the weight). Models should have an onboard V bridle which comes to a point about 9" from the hull with a small ring to provide easy attachment to the pool's central tether & pivot point (see photos from last year’s event above). Boats will be timed over a number of laps to be determined by the commodore. 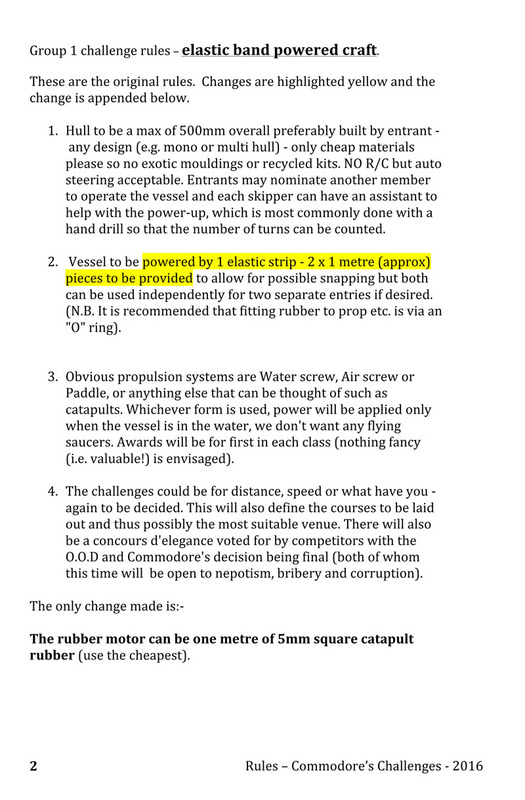 There will be prizes for innovation; elegance, spectacular sinking and of course rule bending with prizes awarded accordingly (or not). Rather than a one-off event, the preliminary idea is for a series of say 4 (possibly in concert with other major events - maybe using the big pool in an interval?). Boats to be timed over a number of laps say 5? Fastest time of day boat receives 10 points, Second 8 points and so on down to 1 point with scores to be carried over to next meeting and the winner of the event will be the boat with the highest points at the end of the series. The boat could be sailed by a proxy skipper in the absence of the owner and still qualify. Owners might receive some tatty trophy in the worst possible taste! The main event to be held at Mannanan would be a standalone event on the day but local skippers could carry their scores forward and hold a round of the series at the same time. · Max length = 1 foot, Max beam = 5" (300mm x 125mm). · Recommend the hull is kept on the light side. · Hulls might need a fixed trimming rudder. · The main idea is that it should cost as little as possible with most parts coming from the scrap box (cannablise the old straight runners??). · Two secure fixing points for bridles at least 6" apart on centre line as runs can be clockwise or anti clockwise to suit the vessel. This is likely to be a function of the handing of the prop. · The skipper is required to provide a bridle running between the two fixing points with a ring for securing to the fixed tether. See the diagram below for dimensions of the bridle. Skipper is free to choose where to position the ring on the bridle. · A timber batten will be fixed across the top of the pool with a tether attached to the centre point and a snap hook on the other end which will connect to the bridle ring. · Bridles to be set up so that the boat runs about 4" away from the side of the pool to avoid wash interference! · 3 classes are now proposed. · Standard – up to a 380 size brushed motor and maximum 6 volt battery using either AA, AAA or NiMH pack. · Hooligan - any size of brushed motor and a maximum 9.6 volts battery using either AA, AAA or NiMH pack. · Super Hooligan – unlimited choice of motor & batteries, but keep an eye on costs and principle of using stuff from your stock box. · On/Off switch to be fitted and easily accessible when the boat is running (fit a big toggle switch). · Prop shaft recommended to be 4 mm thread as much more choice of prop available, although use whatever is in your scrap box. 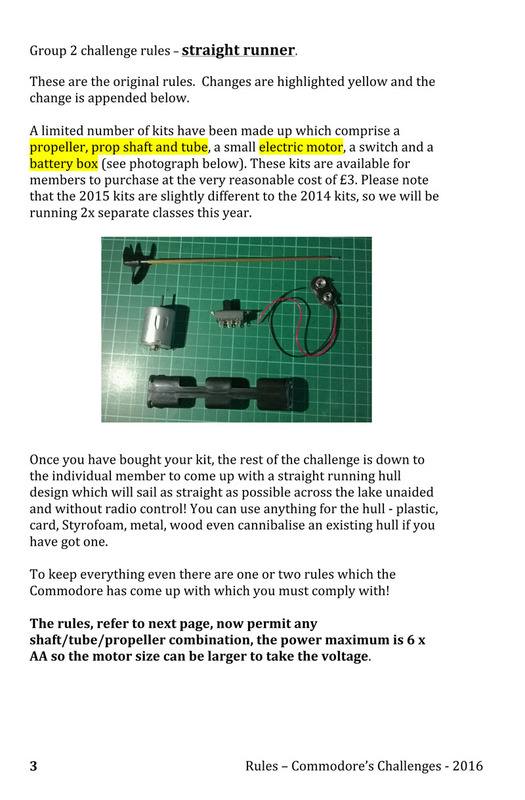 · Plastic only propellers (to minimise cost) - bear in mind the water depth is only 3 or 4 inches when deciding on prop diameter. Finally - Printable suggestions welcome! Boat length should not exceed 300mm. From research they will fall into two main engine categories (a) flexible boiler hence pop-pop and (b) a heated coil. There are also two main methods of heating (1) some form of candle e.g. tea lights etc (ordinary candles apparently give off too much soot) and (2) meths or oil soaked wicks in holder. Again from research there are pro's and con's to each method so experimentation would seem to be on the cards. There could be 4 entry classes, viz. a1; a2; b1; b2. Apart from the boat length there is no building restriction, however my current thought is to run the challenge in a 10 foot diameter kiddies paddling pool with the boats tethered to a central pivot so a tethering point in the bow of the craft or amidships should be built in. Prizes (something cheap and in very bad taste) envisaged for the fastest, the most innovative; the prettiest; possibly the nicest smelling and anything else I can think of. Once again my decision is final and liable to change by the minute and on the spot. I will provide the boats and transmitter. One boat will have its rudder and throttle on the left stick and the other the same on the right stick. Both boats will have ahead and reverse ONLY i.e. no speed control. The idea is to start off with the boats on each side of the pier facing forward then to be sailed TOGETHER round a simple course - say out through a gate round a distance buoy then back down though another gate to finish one on each side of the pier facing inwards . The usual penalties will apply, and the buoys will be alive all the times. There will also be penalties for any boat being intentionally stopped for any perceptible length of time -say more than --30 secs. This challenge could develop into an on- running event over the season with points accrued divided by number of attempts! 3. Rubber band powered models. 4. Compressed air powered models. (see rules from previous challenges below).